Arunachal Pradesh Chief Minister Pema Khandu on Sunday said Arunachal Pradesh could not capitalise on its tourism potential because of mere lip service by the previous government, but witnessed a surge in funding after he took over as the CM. Khandu who launched the third leg of Arunachal Rising Campaign during the closing ceremony of the Yomgo River Festival here said the fund allocation for the tourism sector under the present government jumped from Rs 16 crore to Rs 160 crore in the 2018-19 fiscal year and the state needs more investments of funds to prove its potential in the sector. The CM said the Yomgo River Festival, being one of the oldest tourism festivals in the state was the need of the hour and after its revival, the area could see boost in its tourism potential. The Yomgo festival needs better planning and management for it to attract more visitors, Khandu said. To minimise wasteful expenditures on the festival, he suggested for a permanent festival ground and infrastructure instead of makeshift structures for which he assured all support from the government. Khandu also suggested giving local touch to the permanent infrastructure to be built. The chief minister also said that Aalo area is rich in scenic beauty and for it to be used to its maximum potential, the place needs good lodging facilities, homestays and hotels. For that he urged the local businessmen to come forward to invest in infrastructure for support to tourism. He also advised the people to maintain cleanliness during festival and suggested them to take up cleanliness drive after completion of celebration. The chief minister said festivals such as Basar Confluence is a right effort in promoting tourism based on sustainability and preservation of ecological richness. He said other festivals can take cue from Basar Confluence of discouraging plastic materials and encourage use of naturally available materials. Speaking on development of the area, the chief minister said for drinking water, the government has sanctioned Rs 32 crore under North East Special Infrastructure Development Scheme and for Aalo General Hospital to be elevated as Zonal Hospital an amount of Rs 5 crore has already been sanctioned. He further assured to support for the improvement of Aalo township road. Earlier in the morning, Khandu attended the foundation laying of 40 bedded ANM hostel, funded by Indian Oil Corporation Ltd under CSR. Having inspected the facilities in the ANM school, the chief minister promised to fund for additional 20 bedded hostel and for expansion of institute’s academic building. 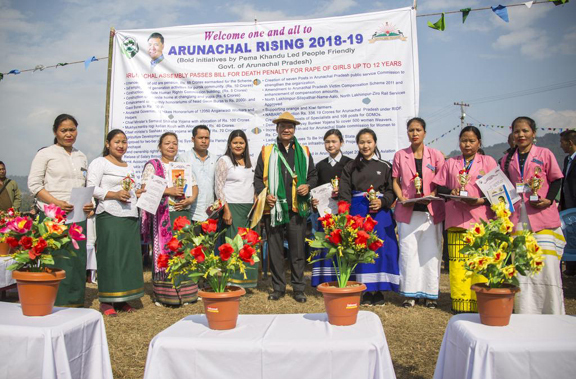 Khandu also felicitated the best ASHA, Anganwadi workers, progressive farmers and student winners of essay writing competition on Arunachal Rising on the occasion. The chief minister was accompanied by Union minister of state for home Kiren Rijiju, tourism minister Jarkar Gamlin and deputy speaker Tumke Bagra. The CM in his speech here lauded the efforts of the Gram Preraks and Communicators, who are disseminating information about the state and central flagship programmes at the grassroots to the rural people and students at the school level respectively. Khandu also appreciated the district administration for conducting 18 Sarkar Aapke Dwar camps across the East Siang district and extending benefits to over 27580 beneficiaries. “Ours being a diverse state, the concept of Team Arunachal has been brought in to take along interest of all irrespective of where they are from and who they are. Team Arunachal concept is not merely for lecture but will be implemented at all ground level. The present government being inclusive has involved all stakeholders in preparation of state budget,” Khandu said. The Arunachal CM further said for equal development of all places in Arunachal, the state government is empowering the institution of deputy commissioner for it will facilitate the concerns of grassroots to be heard. He said for development to take place efficiently, MLAs and government officers will be given training to make them aware of their roles and responsibilities. Among others present on the occasion here were Lok Sabha MP Ninong Ering and MLAs Lombo Tayeng, Tatung Jamoh and Kaling Moyong.